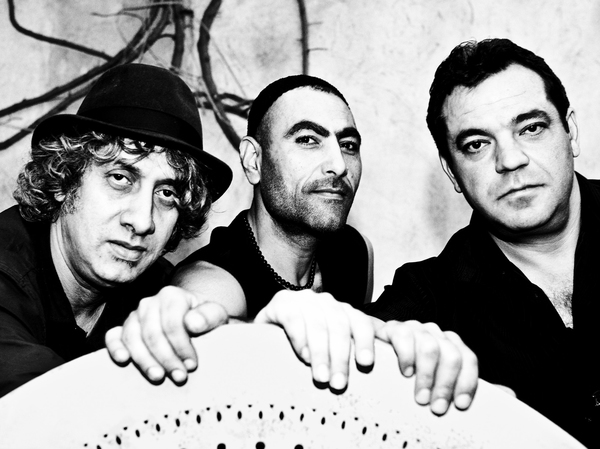 Created in 1995 in Marseilles, the trio ORIENTAL FUSION was born of the will to gather energetic and spontaneous individualities around their oriental roots: Algeria, Egypt and Armenia. Three traditions, three exiles, three sensibilities which hold a musical dialogue led by Hakim Hamadouche's Arab-Andalusian singing to deliver a glowing music between free jazz, punk rock and Chaabi (Algerian blues), with great detours in improvisation. The coming together of these three cultures - at the crossroads of jazz, contemporary and ethnic music - led in 2000 to the album "Oriental Fusion" (Transes Européennes label) with artist featuring by Tom Cora and Barre Phillips, among others. Striking and powerful! 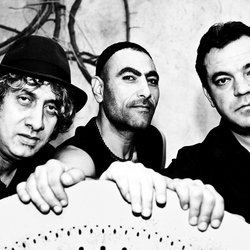 Born in Algeria, raised in Marseilles, Hakim Hamadouche is best known for being the mandolute player of French-Algerian raï singer Rachid Taha with whom he collaborates since 1991. His playing and raucous singing recall the beautiful melodies of Northern Africa and its oriental rhythms. In 1995, he created the band Oriental Fusion with Ahmad Compaoré and Ed Hosdikian. His various collaborations - in the field of jazz, rock and world music - include Lili Boniche, Patti Smith, Bill Laswell, Catherine Ringer, Brian Eno, Tricky and Les Têtes Raides. Of Egyptian and Burkinabé origins, Ahmad Compaoré confirms his singular talent alongside Fred Frith, Marc Ribot, Jamaaladeen Tacuma, Barre Phillips, Camel Zekri or Egyptian choreographer Karima Mansour. With a constant craving for exploration and discovery, he shares his creativeness between dance, theatre and cinema. Twice recipient of the Culturesfrance "Hors Les Murs" award, he lived in India and Japan as part of residencies of creation. Involved in many projects, he is currently a drummer within Lucky Peterson's quartet. Original, sensibly wild and label-free, the style of this musician is unique. After classical studies at the Conservatoire de Marseille, Ed Hosdikian immersed himself in the world of regional rock bands, before setting off to the United States where he practised jazz at the renowned Berklee School of Music. Back in France, he returned to his roots through the creation of the trio Oriental Fusion in 1995. However, he constantly seeks new musical experiences through collaborations with artists like Jacques Higelin, Michel Petrucciani, Nina Simone, Fred Frith, Jamaaladeen Tacuma and Youssou N'Dour.